The future is coming into focus. There is such clear momentum around a set of emerging behaviours that we can, without a doubt, project the exponential growth of raw unfiltered data. Think of it like Moore’s Law for content. The speed, scale, and number of distinct elements of produced content will double every 24 months. Call it Rosenbaum’s Law — unless you know of someone who’s quantified the growth before today. To be clear, the reason for this growth is that we’ve allowed three things to merge into one. As each of us enables more wearable technology and devices that invite us to ‘check in,’ we fill our personal channel with data. Our location, our weight, our order from Fresh Direct, our “Likes,” our Yelp reviews, our Instagram photos. This is raw data — unfiltered data — of little interest to anyone other than our close friends. But as Facebook, Google+, LinkedIn, and others have increasingly defaulted our posts to “Public” visibility, we each add meaningfully to the volume of raw data on the web. At the same time, those of us who produce content, as opposed to data, no longer look to lure audiences to find our material on our own blogs or sites. We collectively go where the audiences are, sharing our information in tweets, links, uploads, and posts. A single well-crafted post can find itself with four or five homes, each of them adding to the collective volume of information on the web. And as the web breaks free of the bonds of the desktop, and moves rapidly into mobile, our always-on, portable computers will generate content wherever you are. In fact, 2013 is predicted to be the year that mobile traffic desktop traffic. And then there’s the emerging class of new digital devices that make content — from GoPro camera rigs, to the new video capabilities on the iPhone 5s, to the soon-to-be-unleashed Google Glass. Video is the fastest growing collection of raw information. And it is the hardest to contextualize or ‘scan’ before you engage the play button. Video consumes both bandwidth and attention in massive quantities — with little guarantee of useful data until it’s been engaged. These things are facts. Raw data is growing at a rate we can hardly imagine — and it will only grow as devices and behaviors become more adept at raw-content creating. According to Cisco, by 2016, 1.2 million video minutes — the equivalent of 833 days (or over two years) — would travel the internet every second. And YouTube’s numbers reflect the dramatic grown in web video, with 72 hours of video uploaded every minute to YouTube, which equals more than one hour of video being uploaded to YouTube every second. Today, YouTube is also the second-biggest search engine on the web. So, if you accept the facts behind Rosenbaum’s Law — that the creation of raw content is going to double every two years — then the nature of consumption is what is going to change on the web. The Curation Economy is built on some important, but I would argue inevitable, assumptions. The First Law: People don’t want more content, they want less. We’re overwhelmed in raw, unfiltered, context-free data. Humans want it to stop. The Second Law: Curators come in three shapes. There are Curation Experts — people whose background and depth of understanding makes their curatorial choices valid. If you’re looking for medical advice, you want your video viewing curated by a doctor, not a patient. There are Editorial Curators, who manage the voice and the collections of the publications and sites they organize. And there are Passion-Driven Curators, they love their particular area of focus and attention and bring that single-minded focus to every piece of content they touch. The Third Law: Curation isn’t a hobby, it’s both a profession and a calling. Curators need to be paid to be part of the emerging ecosystem. What’s a fair fee will depend on how critical the curator’s output is in the category. But an economic basis is essential, and inevitable. The Fourth Law: Curation requires technology and tools to find, filter, and validate content at the speed of the real-time web. Curation can’t simply be a human with a web browser — the mix of man and machine is essential here. The Fifth Law: Curation within narrow, focused, high-quality categories will emerge to compete with the mass-media copycats who are filling the curation space with lists, cat videos, and meme links. The simple fact is this: The web used to be a relatively closed community of makers. In the past, anyone could browse the web, but content creators needed to have tools, literacy, and time to create and publish. In the past few years, the growth in mobile devices along with the widening definition of content from contextualized data to raw data has opened the floodgates of participation. I’m not arguing against this trend — far from it. What I am saying is this: With creation now ubiquitous and overwhelming, we must adopt new content organization and consumption methods in order to find meaningful information in the fast-moving data flow of the web. The cure for information overload is coherent curation — data-driven discovery managed by skilled, thoughtful, and in some cases expert curators. Much as the quality of a restaurant is created by the chef, the quality of the curated end-product is going to be made by the curator. And that — without a doubt — creates new jobs, new opportunities, and even new economies in a world of information abundance. 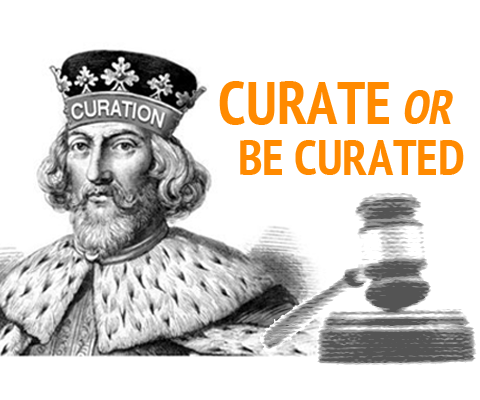 Curate or be curated — that’s the new face of digital content in the always-on world.